Officials tour the new plant. Leading global paint manufacturer Berger Paints has strengthened operations in Oman with the launch of a new mega-sized facility that the company said will be by far the largest paint manufacturing facility in the country. 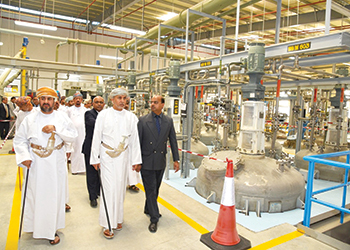 Located in Sohar Industrial Estate, the state-of-the-art plant covers an area of around 50,000 sq m, and has the potential to transform the sultanate into a powerhouse in the multibillion-dollar paints and coatings industry in the region, according to Berger Paints. The ultramodern facility is designed and equipped to produce an array of high-performance, environment-friendly and durable coatings, finishes and other paint products. “Once fully completed, the plant will have the potential to single-handedly produce more paint than the total current paint consumption in the country,” a spokesman for Berger Paints said. The objective is to see this plant become the hub of exports across the GCC, he said, adding, by the end of this year, the company hopes to begin large-scale exports to neighbouring countries like Qatar. Until now exports have been constrained by capacity shortfalls and have been limited to occasional exports to smaller countries, he added. The plant was formally inaugurated at a ceremony in December by Ahmed bin Hassan Al Dheeb, under-secretary at the Ministry of Commerce and Industry. The ceremony was attended by senior government officials, as well as top-level executives of the project’s joint venture partners Al Hassan Group of Companies (Oman) and India-based Asian Paints. Hassan Ali Salman, chairman of Al Hassan Group, said the launch marked a “new leap forward” in the company’s history and that the factory – its second facility in the sultanate – would be “Oman’s largest paint facility”.